The kids really will have the time of their lives when they are playing inside, under or climbing up and down the ladder of the 6′ x 6′ Windsor Honeysuckle Tower Playhouse. This is something that the kids are going to be able to enjoy for years and it has many great features that they can have a lot of fun with. There is a ladder to allow them a fun way to access the playhouse, a balcony so they can see who is coming to visit and there is a whole lot of space inside for them to host a party or just play games with their little friends. The raised nature of the playhouse means that there is a bit of space underneath which can be used to play or even to store a few things. This is one fantastic looking playhouse that is going to put some very big smiles on some little faces. 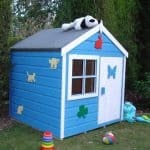 This playhouse has passed a number of child safety tests and has been made using the very best materials. Thick shiplap cladding and a strong frame give it a great look, but they also keep the rain out and offer a strong and safe place for the children to play. The high apex roof looks fantastic, but it is also made with the finest materials to ensure no rain can get inside. Will be hard to get kids to come in for tea! Right here we have one truly gorgeous looking child’s playhouse. 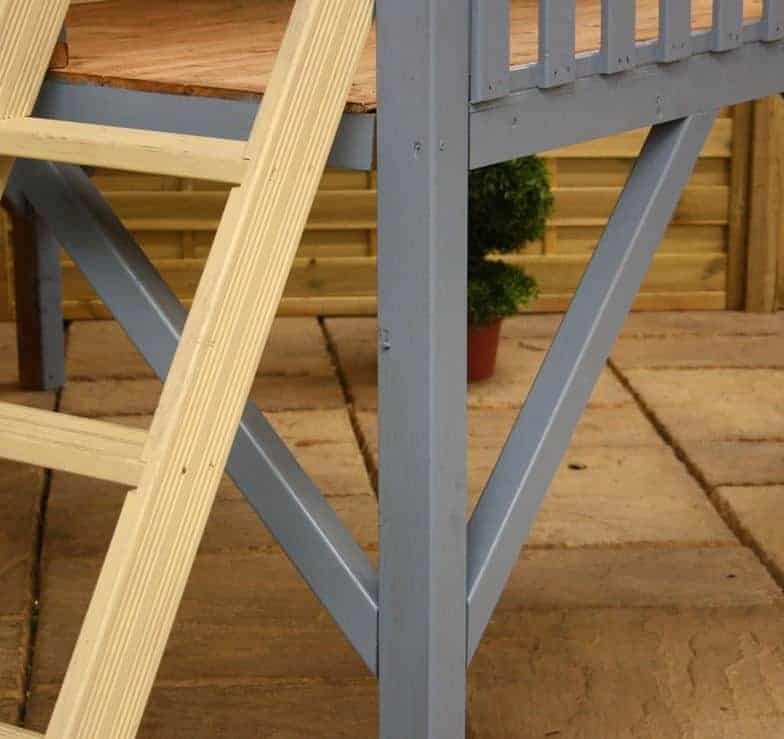 Thanks to its raised platform this is something that is really going to stand out in your garden and become a main feature in it, all the while providing the kids with a fun and safe place to play. 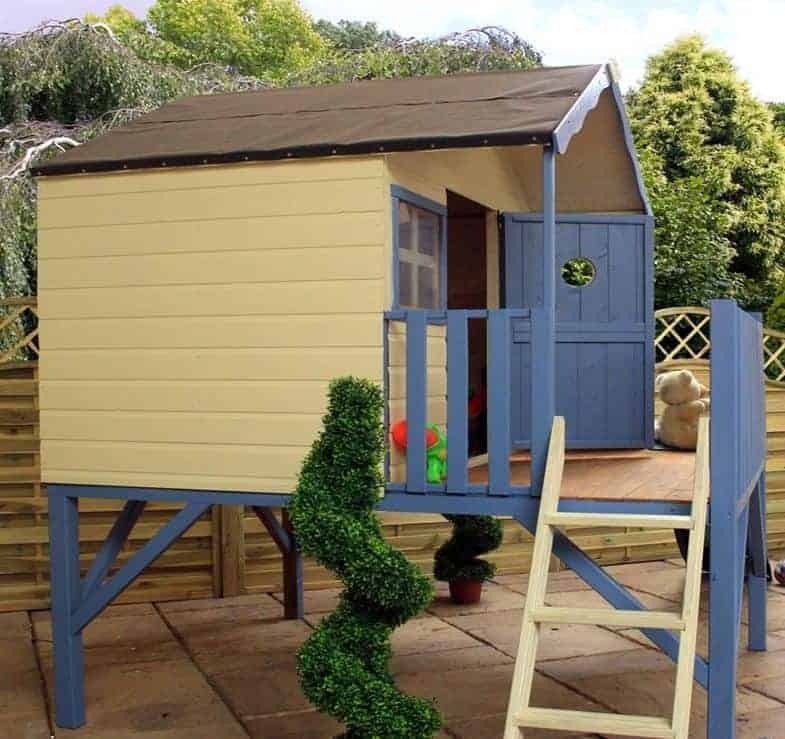 The 6′ x 6′ Windsor Honeysuckle Tower Playhouse is fairly large inside and it does offer the children a lot of room to place their toys or even a table and a couple of chairs. The 6 X 6 size of the playhouse ensures that they will be able to have as much stuff as they like in here. If they have just a load of things cluttering up their bedroom then this can be a great way to cut that down a little bit. 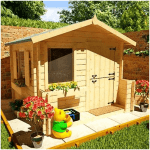 We love how much head room is inside here, from the ground to the very top of the roof the playhouse stands at right around 8 feet high which not only gives it a lot of space, but also makes it a very prominent and striking structure for your garden. One thing that we love about the raised design of this playhouse is how it has a lot of space underneath. This can be used for a number of things for example if the weather is good there is no reason why the kids cannot keep their bikes under here or even sit under it for an outdoor tea party. Part of the fun the kids are going to have with this is climbing up the kid safe ladder to get into the playhouse, this is not a high ladder and it is perfectly safe. There is a charming little balcony that is made safe by this adorable railing so the kids can sit out there if the weather is warm. The roof is very impressive and Windsor have used an apex roof to not only make sure the rain stays out, but also so that it goes with the amazing look of the rest of the playhouse. The roof is very solid and under the high quality roofing felt we have some very strong 8 mm boards. This is a fantastic roof and will be able to keep the rain and snow out all the while looking great. To make certain that the 6′ x 6′ Windsor Honeysuckle Tower Playhouse is up to the task of dealing with years and years of play time with the kids, Windsor have made the shed with the strongest materials. The cladding is this fantastic looking shiplap cladding which we love the look of as it as a real friendly and inviting look, but at 12 mm thick it is also strong enough that it can handle a bit of rough play. The frame backing up the cladding is very powerful and made from the strongest wood. This is a 28 mm x 28 mm frame and it has passed every child safety test it has been put through. A good frame is essential for a long lasting playhouse and we see this frame lasting easily 20 or more years and still being strong. It will keep the playhouse solid and rigid and we honestly can tell you that we have no worries about this frame at all. To make sure the kids can put as much stuff as they want inside here and be able to have lots of friends over to play, Windsor have used some very high quality boards for the floor. The boards are actually the same kind that are used for the roof, but these ones are a slightly thicker at 10 mm to give the a bit more strength and to ensure they can take a lot of weight. 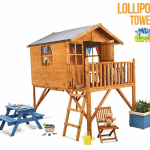 Once you have built the 6′ x 6′ Windsor Honeysuckle Tower Playhouse, you will want to give it a good coating of wood treatment and then do this every year to make sure the wood stays protected. The playhouse comes with a 10 year anti rot guarantee to make this valid, you must make sure to treat the wood. As well as this you get a 1 year warranty that protects you against any general wear and tear. The door on the playhouse is just so lovely that we think it is one of the first things that you notice about the playhouse. The door is a very generous size and at nearly 2 feet wide the kids will have no trouble at all fitting things through the door to get them inside. What makes this such a great looking door is the flower feature that Windsor have placed on it. 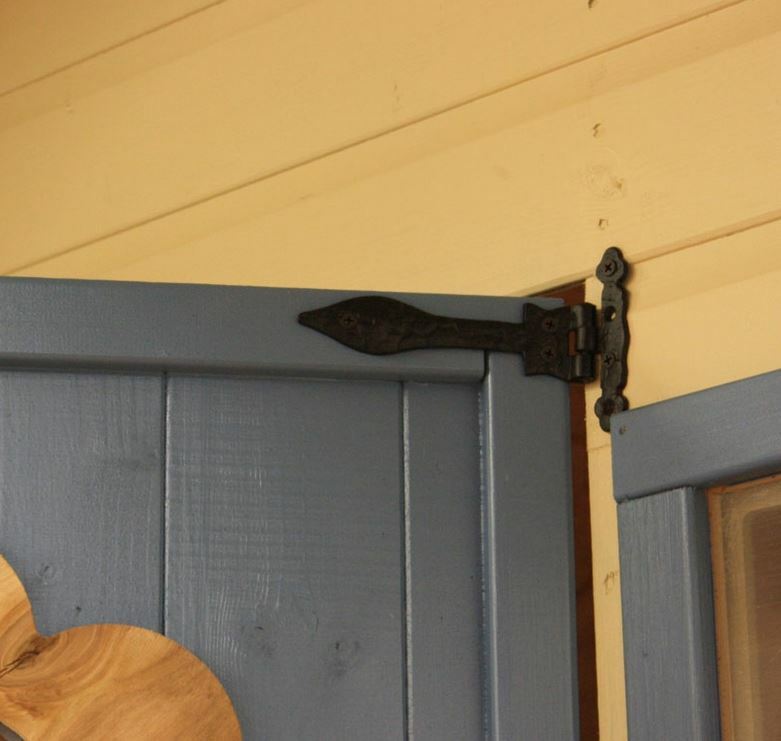 As well as being a great looking door, Windsor have made sure that it is up to the task of taking a slamming every now and again by using some very strong door hinges to keep it in its place. At each side of the door there is a window. These windows are a very good size and will allow for plenty of light to get inside. To make the windows, kids safe, Windsor have used some very durable, anti shatter styrene so that there is never any danger of there being broken glass. The kids will be very safe inside here and the raised nature of the playhouse means that it is actually pretty secure at all times. Now there is no lock on the door, but we feel this is not a bad thing as the last thing kids want to be dealing with is a lock, but it would be very easy to add a padlock on here which would be a good idea if you want to keep the playhouse locked up overnight or when you are away. Those two large windows make it so this is not the most private playhouse in the world, but it does mean you can have a little peek and enjoy watching the kids have fun inside. A set of blinds or curtains could be easily added if they want a little more privacy. When it comes to giving the playhouse your own kind of style, we feel that the best way to do this is with the wood treatment. 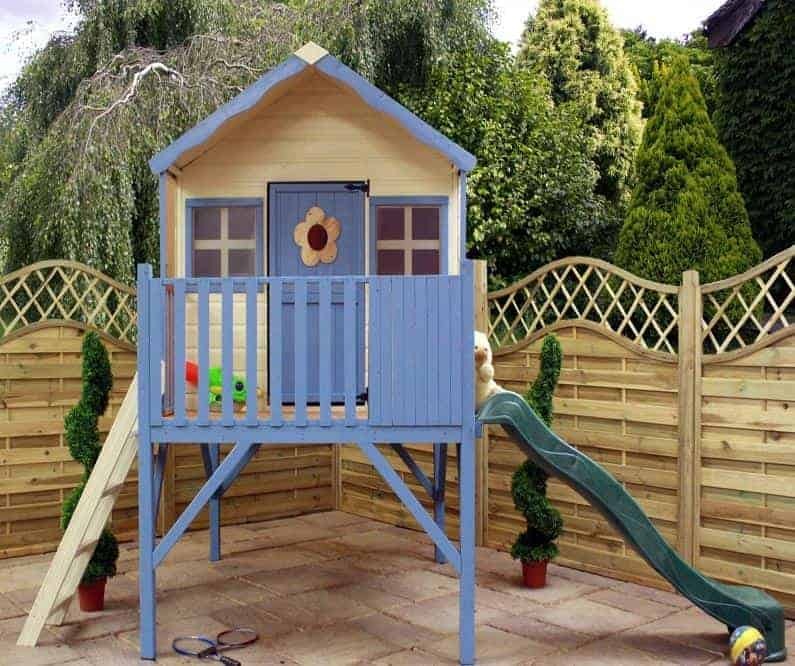 Let the kids pick the colour of the wood treatment so that they can have the playhouse their favourite colour or at least a colour they like. One added bonus about this playhouse is that there is no extras that you need to worry about buying. For a child’s playhouse the quality here is quite incredible. 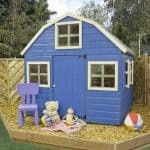 We have seen summer house and sheds that are not made with as much high quality as this. 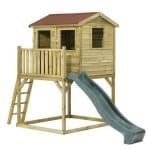 Windsor really have a knack for using materials that last and with a little bit of help on your part, the children will be able to have fun with this for as long as they can fit inside. There is a lot of room to play inside which is more than enough, but the added balcony and area underneath give the kids even more space to enjoy and make use of. You will for sure need a friend to help you with this and you need to know going in that this is going to take a while to build. Just read the instructions properly, have regular coffee and snack breaks and you will get through it. You really cannot put a price on a child’s happiness and as cheesy as that sounds we stand by it. This is a fun playhouse, but it is also made so well that there is no reason your kids or grandkids cannot make use of this for their whole childhood. Final Thoughts: We are just so impressed with what the 6' x 6' Windsor Honeysuckle Tower Playhouse offers that we wish we could go back in time and bug our parents to buy this for us. It has just so many features that kids will love. The actual playhouse is great, but they have the ladder, the balcony and of course the little area underneath to enjoy as well. In all this is a playhouse that really is going to provide years of fun and because of the top quality materials used to construct it, it will be more than up to the task of staying strong for all those years. 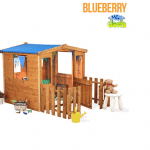 This is one great playhouse and we can assure you the kids will absolutely love it.